Note. For your convenience I also list some of the Sabrina merchandise that does not directly involve Salem. Much of this information comes from Judy Reboy, who writes for Animato! magazine ("The Animation Fan's Magazine"). I am very grateful for the continued support Judy has given to this site. Note. All prices given in dollars refer to US dollars, where most of my merchandise spotters have done their spotting! If you see some Salem Merchandise and you are not in the US, then tell me about it! For that matter, tell me even if you are in the US! There are several Salem toys, two of which are the Salem Dolls which are part of the Girlsworld Sabrina Dolls range. The main Salem Toy [PICTURE] talks (3 or 4 phrases from the show), and Nick Bakay says it speaks like him (which is a relief, really, since it is supposed to be him...), although he has also said he is somewhat displeased with the sound quality. This toy is now no longer in production. The other Salem is a small 'thing' which comes free with the Sabrina Doll [PICTURE]. The Sabrina Doll and Harvey Doll have been seen on sale at $9.97 each, with the Bed Time Sabrina at $16.97. I've done a little online searching and found the Sabrina fashion doll listed at a few sites (but remember the Clarissa CD debacle before assuming this means they're actually available!). Most places only offer the fashion doll, not the soft-bodied "bedtime" one (referred to below as "Bedtime") or the Harvey or Salem ones. Here's some info. The final cost to me of the Sabrina fashion doll, including shipping and tax, if any, is included for comparison purposes. The following are excerpts from e-mails Judy Reboy has sent me. 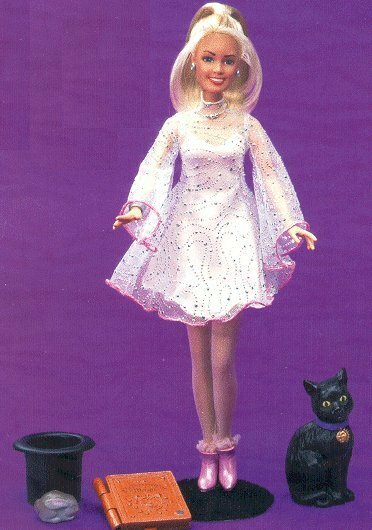 There's also a photo of another Salem-less doll, "Dress and Sparkle Sabrina", who comes dressed in a formal gown. She comes packaged with the mirror from the opening credit sequence. On a business trip to Chicago, my husband stopped by a Viacom Studio Store (Apparently a chain. This one was in Downtown Chicago on Michigan Avenue). He found an entire selection of mostly exclusive Sabrina merchandise. He found a T-shirt with artwork of a flocked Salem sitting on a spiral next to The Book. The Salem logo appears on the bottom left of the illustration and the Sabrina logo appears on the back of the shirt. Apparently, they also had a blank book (like a diary) with the same picture on the cover. Judy Reboy has since found out that Viacom Stores did take mail orders. They did not have a web site or even a catalog, but they did have a toll free number, 1-888-9VIACOM (US). (When you called, you had to ask for the Paramount department (or the Nickelodeon department if you were looking for Angry Beavers stuff)). Unfortunately, the Viacom Store is dead and gone. Paramount has a small catalog of items based on some of its more popular shows, including Sabrina. They have three Sabrina items: a T-shirt with a cast photo (incl. Nick Bakay), a logo sweat shirt and a logo jacket. All are available in kids sizes only. Nick Bakay did a recording session in late 1997 or early 1998 for a fortune telling Salem electronic toy from Tiger Toys which came out in the US during the week starting Monday 17th of August, 1998. Called the Ask Salem Psychic Necklace , it is a purple plastic keychain/necklace that you activate by pressing a button with a raised cartoon picture of Salem. It responds with one of eight random phrases (e.g, Possibly , That's a yes! ). It's apparently really cute, but the sound is speeded up, so Nick Bakay will probably be displeased with this toy's sound quality too. Another talking Salem toy that came out during the same week is Sabrina's Psychic Phone . It's a real pink and purple phone (yes, this is a real phone), in fact it is a nice replica of the purple phone in Sabrina's bedroom. Before it starts ringing, Salem's voice chimes in with one of four phrases alerting you that the phone is about to start ringing. The sound on the voice clips of Salem is perfect - not sped up at all like the other toys. The only problem with it is that you can't make it talk until there is a real incoming call (!). A similar item has been spotted at a Toys R Us store, and is called the Ask Sabrina Psychic Diary . It is a sort of electronic notepad, but it also contains an element that allows you to ask Salem questions and he has eight different responses (the same as those on the Ask Salem Psychic Necklace - see above). The verdict? Looked cute but kind of pricey at $29.99. Also available, but not involving Salem, is Sabrina's Psychic Crystal Ball . It retails for around $30 (But note I've had reports of it on sale for $22 at Toys R Us ) and works much like the other toys in the "psychic" line, except it (apparently) doesn't make any noise, it just displays the answer in/on the ball itself. One can also purchase Tiger Toy's Salem Giga Pet. I am told it's "fun, if a little infuriating when it won't cooperate!" There's apparently a neat virtual representation of Nick that morphs into Salem when you start it up. This has also been spotted at a Toys R Us . The price was $9.99. I'm from California myself, and we had these key chain toys called Tamogachis. 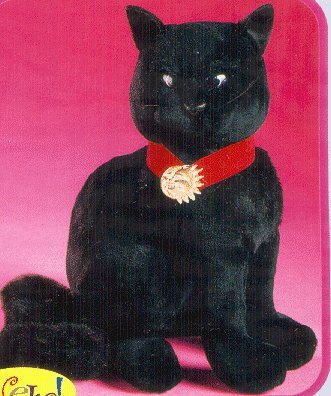 Well, another company put out a "Salem the Cat" which functioned much like the Tamogachi. You had to feed it, clean it and play with it or it would "die" and you would have to reset the game. There is also a plastic Salem on a key chain with a speaker and six buttons mounted in the belly called a Giga Pet Gabber , however I have no more info on this toy. Salem's Guide to Life with Sabrina: A Spellbinding Trivia Book with Stickers . They have photos from the show. A lot of interesting pictures. It is in a large size format, with not a whole lot of pages. The pictures on the stickers are clear and interesting. It has trivia, 'lite' dialogue, good photos, and recipies, 50 stickers - $6.99. (also seen at $6.49, so shop around). Minstrel Books, a subdivision of Pocket Books, are releasing a series of Salem adventures. The books are about 100 pages long. The first book: Salem's Tails #1: Cat TV by Mark Dubowski was released during the summer (1998). An excerpt appears at the end of the Sabrina novel Go Fetch! by David Cody Weiss and Bobbi JG Weiss, which is currently available. In September 1998, two new novels were released. Teacher's Pet , about Salem sneaking into school in Sabrina's backpack, is the second in the series. There's also Salem Goes to Rome , an "untold tale" which takes place during the events of the TV movie Sabrina Goes to Rome . This particular story is unnumbered. The stories are a little simple, but I am told they're nicely done. Salem's Tails #3: You're History just came out (as of early November 1998). It's about Salem getting trapped in Sabrina's history book. The cover photo has Salem dressed as George Washington. The next book, theoretically number 4 even though its the fifth, is entitled King of the Cats and is due in January. There is a 1999 Sabrina Calendar. Among the photos is the shot of Salem driving the red sports car, and it looks as though he appears at the bottom of the calendar pages as kind of a Greek chorus commenting on that month's photo. There is a Sabrina, The Teenage Witch: Spellbound CD-ROM. Ironically, there are two versions, one with and one without the Salem Giga Pet. The one with the "free" Giga Pet is approximately $10 more than the one without - exactly the price of the Giga Pet itself! It's great, and there's lots of Salem. The character designs are terrific. One thing...I do get the feeling this one was in development for a very l-o-n-g time, as Penn Gillette's Drell has the largest speaking part, and although Jenny is nowhere in sight, neither are Valerie and Mr. Craft. Do you have more material? Pictures or sounds of Salem? Information? Corrections? Comments? Links? Please e-mail them to me: py8ieh@bath.ac.uk. See Also: The Character, The Voice, The Puppets, The Cats. Up to the Salem Site. This page is maintained by Ian Hickson (py8ieh@bath.ac.uk). Last updated in January 1998.